2012 Volkswagen Passat Pros and Cons: Why (Not) This Car? Volkswagen's mission: to become the world’s largest auto maker. Problem is, they haven't been selling nearly as many cars in North America as they have been elsewhere. To fix this, they designed the new 2012 Passat specifically for North American tastes--the rest of the world gets a different Passat based on the old one--and constructed a new factory in Tennessee to build the car. So, how well do the Germans know what we want? As plain as the exterior. Why the 2012 Volkswagen Passat? The 2012 Volkswagen Passat is offered with three engines: a 170-horsepower 2.5-liter five-cylinder, a 280-horsepower 3.6-liter V6, and a 140-horsepower four-cylinder turbodiesel. The first gets the job done, and the second performs at least as well as competitors' V6s, but the third is something that no one else offers in a mainstream midsize sedan in North America. Don't let the peak power figure fool you. Diesels peak at low rpm, so while they can't match gas engines for peak power they perform at least as well in typical driving, while getting much better fuel economy. The Passat TDI earns EPA ratings for 30 mpg city and 40 highway, quite good for a large sedan. And many drivers do considerably better. During my test drive the trip computer reported high 30s in suburban driving and about 50 on the highway. Volkswagen's research must have found that Americans highly value rear legroom, because the Passat has an abundance of it. Unless you're an NBA center you'll have plenty of room to stretch out in the back of this sedan. Elegant from this angle in dark colors with the SEL's 18-inch alloy wheels. Plenty of legroom, but note the lack of a rear air vent. Some midsize sedans put a higher priority on styling than on driver visibility. As a result, they're hard to see out of. The Passat, in contrast, has a relatively upright windshield and (by current standards) thin pillars, so it's easy to see out of. None of the sedans in this segment are especially fun to drive. But compared to this uninspiring average the Passat feels tighter and more direct in the way German cars are known for. The five-cylinder car actually steers and handles better than the TDI or the V6, as it has less weight over the front wheels and conventional hydraulic-assist steering rather than electric-assist power steering (EPS). Why Not the 2012 Volkswagen Passat? 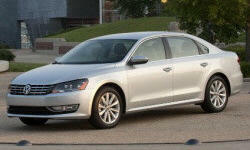 To offer a larger Passat at a lower price, Volkswagen cut back on the quality of interior materials. The resulting cabin doesn't seem cheap so much as very basic, even in SEL Premium trim (which adds a combination of leather and faux suede to the seats and plastiwood trim). Radically conventional styling reinforces this impression. The new Passat has a very roomy rear seat, but no rear air vents. So on hot days it might not be so comfortable back there after all. Plenty of room for your stuff as well. The new Passat isn't loud inside, but others are quieter and seem more upscale as a result. The 2012 Passat isn't an unattractive car, just a very plain one. This said, in dark colors with the uplevel trims' 18-inch wheels the car appears somewhat elegant. Judging from the new Passat, Volkswagen's research found that North Americans put a high priority on rear seat legroom, prefer conventional styling, and aren't willing to pay more for upscale materials. Though the resulting car could hardly be less exciting to look at, strong sales of the new Passat suggest they were correct. Torque makes the TDI well-suited to American driving styles. One of the interior's dime store bits. Vehicle provided by Dan Kelley of Suburban VW in Farmington Hills, MI. Dan can be reached at 248-741-7903. 2012 Volkswagen Passat pros and cons, according to Michael Karesh: the best reasons for buying (or not buying) the 2012 Volkswagen Passat. Join TrueDelta to post your own impressions.